Home » all » What does TripAdvisor’s Red Badge look like? 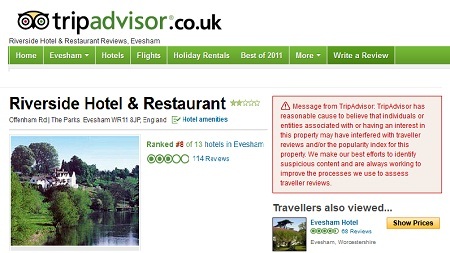 This is what happens when TripAdvisor thinks there is evidence you have been fiddling your reviews. Message from TripAdvisor: TripAdvisor has reasonable cause to believe that individuals or entities associated with or having an interest in this property may have interfered with traveller reviews and/or the popularity index for this property. We make our best efforts to identify suspicious content and are always working to improve the processes we use to assess traveller reviews. Note: This hotel works with an Online Reputation Agency who have written to TripAdvisor asking for disclosure of the information used to make this decision.